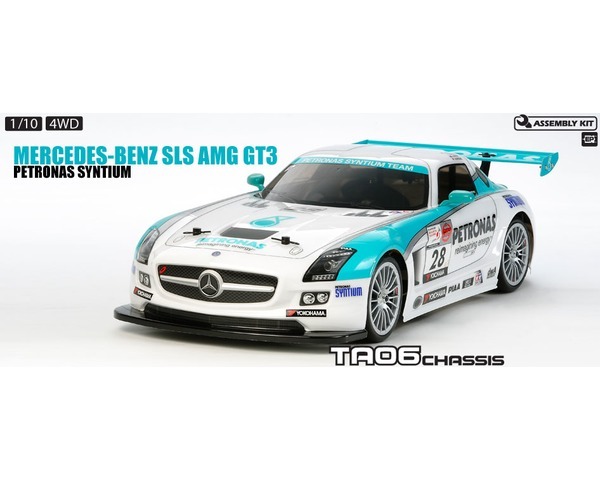 The Mercedes-Benz SLS AMG GT3 is a racing machine based on the production SLS AMG, which debuted in September 2009. Its long-nose, bobtail body design features gull-wing doors and a front-mounted 6.2-liter V8 engine. This particular racing car was entered into the 2012 Japan Super Taikyu Series of endurance races by the Petronas Syntium Racing Team. The team impressively took five consecutive wins at the start of the season on its way to claiming the championship title. The TA-06 serves as the advanced chassis platform for this particular kit. Compared to the TT-01 Type E chassis, which the Mercedes Benz SLS AMG GT3 is also available, the TA-06 has a dual drive train, advanced suspension geometry and various setting options that will enable the user to achieve higher performance both on and off the track.